In the wake of an election that has left us facing such xenophobic rhetoric as “Build the Wall” and establishing a “Muslim Ban,” many activists have said that we must build bridges in order to make human connections and provide people with sanctuary, not walls. As Palestinian Americans witnessing the destruction of communities and diverse ethnic and ecological landscapes, both in the U.S. and internationally, artists Lamia Abukhadra and Leila Awadallah are interested in breaking down walls that should never have existed. With the support of The Soap Factory, Abukhadra and Awadallah are working with Martin Gonzales to build a physical wall at the Prospect Park Community Garden, where it can be easily discovered and interacted with. 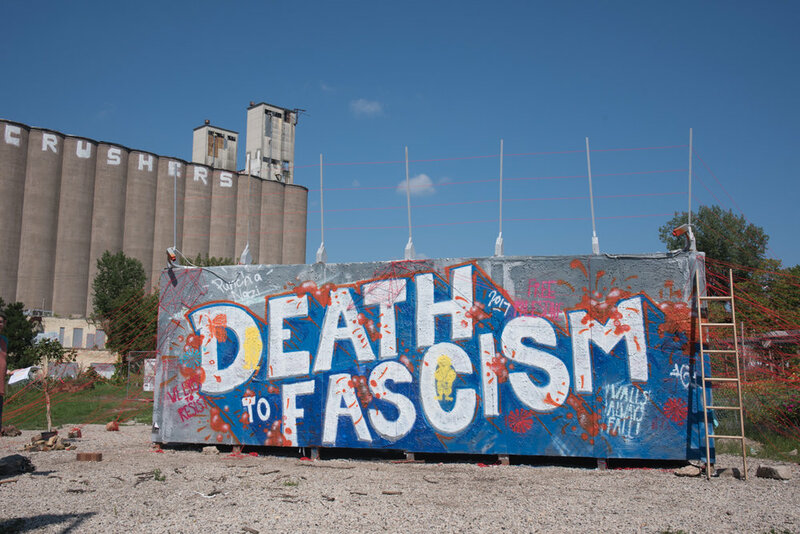 The installation will culminate in a final interactive performance in which the lead artists will invite the community to break down ‘The Wall.’ Abukhadra, Awadallah, and Gonzales hope to ultimately convey that a concrete or metal facade is just that: a facade. A wall can divide and negatively define communities, landscapes, ecologies and livelihoods, but it can and will be dismantled by the subversive acts of our community. Improvisation piece: Leila Awadallah, Louie Darang, Essma Imady, Marggie Ogas, Sarah Abdel Jalil, Colin Walker Wingate, Veera Vasandani, Itly Thayieng, Khadija Siddiqui, Seng Xiong, Pedro Pablo and Jordan Lee Thompson. Please be aware that due to construction access to the installation site is difficult to get to by car and parking in this area is limited, cycling and taking public transit are greatly encouraged. 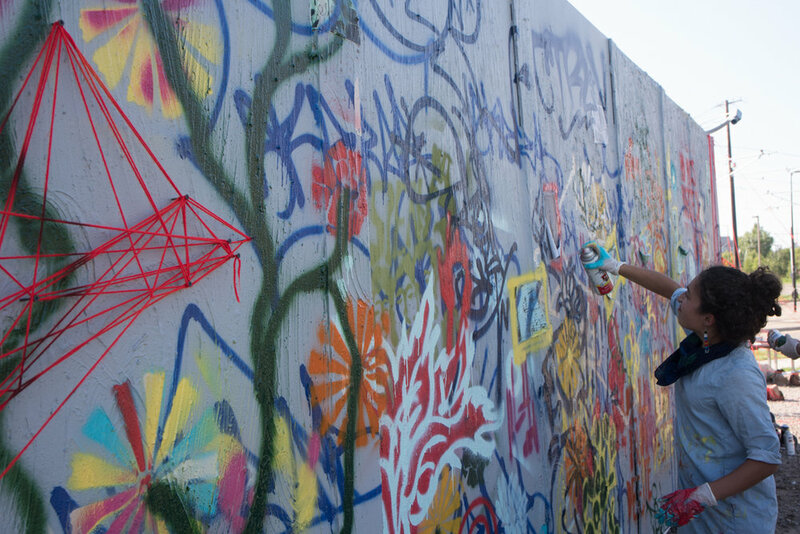 Artists, Lamia Abukhadra and Leila Awadallah, invite participants to leave their mark on ‘The Wall’. 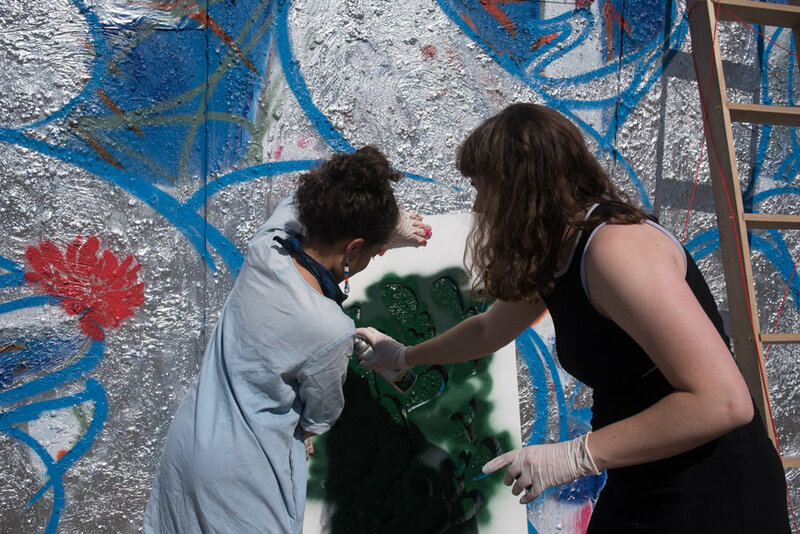 Join us August 13th, 2 – 5pm, for a day of painting and participation. Abukhadra and Awadallah hope participants will use this opportunity to transform a physical representation of the divisive rhetoric the country has experienced this last year. The public is welcome to tag, mark, graffiti their thoughts, feelings, or stories – whatever they wish to contribute to the visual conversation. Please feel free to participate using paint, or by convening with your communities. 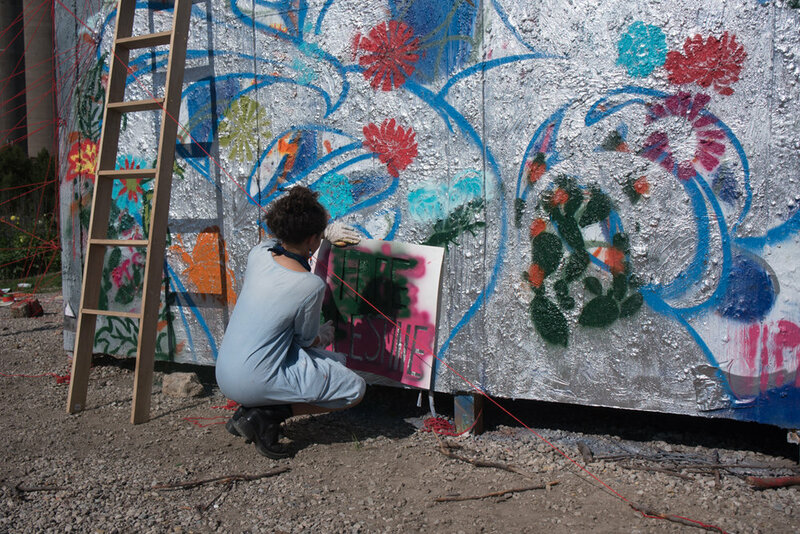 Artists, Lamia Abukhadra and Leila Awadallah, invite the public in participating in the destruction of ‘The Wall’. A concrete or metal wall is just a facade, it can and will be dismantled collectively by those very communities it was build to divide. Grab your hammer, and let’s break a barrier that divides us. Lamia Abukhadra is a Palestinian American artist based in Minneapolis. She is interested in the idea of art as a vessel of expression, communication, identity, and culture for and between disenfranchised communities. Her art aims to dismantle harmful dominant narratives that cultivate and celebrate acts of colonialism, occupation, and genocide in Palestine and the Arab world through personal stories and historical events. Her work has been featured by Altered Aesthetics, the University of Minnesota T.R. Anderson Gallery, and the Quarter Gallery. Leila Awadallah is a Palestinian-American dance artist and creator located in the Twin Cities. She explores movement by imagining where sensations begin, starting from deep within the body, and how they migrate through the body in order to release energy. She crafts work built with the intention of nuancing, complicating, and working to subvert narratives about Palestine. Her work has been presented at the Kennedy Center in Washington D.C. (2016) and in the Moultaqa Leymoun international dance festival in Beirut, Lebanon (2017). Her movement film Reflections On Ice received a SAGE Award (2016). She is in her fourth year as a company member of Ananya Dance Theatre.